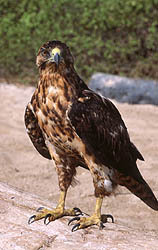 Join Andean Birding on an unforgettable bird cruise of a lifetime to the Galápagos Islands. On an 8-day cruise we will visit 9 islands enjoying easy birding of the 58 resident species and 29 migrants. Birding on the Galápagos affords leisurely views of the birds due to their extraordinary island tameness and much of the time you don't even have to use your binoculars! You will appreciate this as you attempt to identify the difficult Darwin Finches with help from your Andean Birding guide. 25 species are endemic and 21 additional pelagics are not found on the mainland. Only a few of the endemics are difficult to see, so almost all (and with luck all!) species are easily ticked on this trip. Birding Galápagos is great year-round, though a few more species are seen in winter (Oct - Feb) due to breeding cycles and the presence of migrant species. 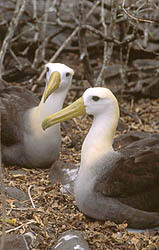 Note however, the Waved Albatross leave Galapagos to feed off of the coast of Ecuador and Peru from January to March. Please note that seeing all of the endemics is only possible with a birder dedicated charter which includes Genovesa, Isabela, San Cristobal and Santa Cruz highlands and is dependent upon last minute permission granted by the National Park. If you are joining a general 5 or 8 day cruise you will not see all endemics but you will have a wonderful experience with the unique and confiding birds and wildlife. Day 1. Fly Quito/Guayaquil to Baltra Island, and Galápagos. Begin cruise. We board the boat on Baltra around midday accompanied by Common Noddy, Brown Pelican and Wilson's Storm-Petrel; sail around Daphne Island (where the Grants have their long-term study wonderfully described in J. Weiner's, The Beak of the Finch) getting our first looks at Nazca Booby, Blue-footed Booby, Audubon's Shearwater, Magnificent Frigatebird; on to Las Bachas Beach for our first taste in Finch identification, Galápagos Mockingbird, Greater Flamingo, as well as some migrant shorebirds. A Yellow Warbler might walk between your legs demonstrating its tameness. A refreshing snorkel, dinner, and night cruise to Tower Island. Day 2. Tower (Genovesa) Island. 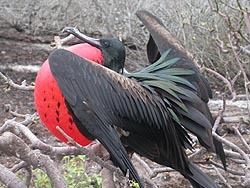 One of the outer islands, Tower is home to more of the pelagic species such as Red-footed Booby and Great Frigatebird which perform impressive courtship displays as well as fascinating nesting behavior. We visit Prince Phillip's steps greeted by Lava Heron, Red-billed Tropicbird, Swallow-tailed Gull and later observing Warbler Finch, Sharp-beaked Ground Finch and if we are lucky we will spot the Short-eared Owl which preys on the clouds of Wilson's Wedge-rumped Storm-Petrels. 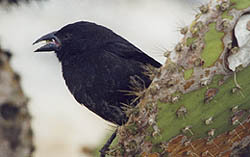 On the other side of Darwin Bay we can also find the Large Cactus Finch and the Large Ground Finch. Snorkel, dinner and night cruise to Isabela Island. Day 3. Isabela Island and Fernandina. 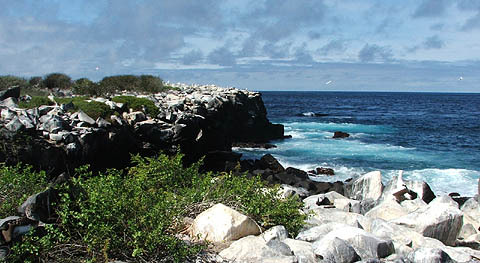 The outer Westside of the Galápagos islands, chilled and nourished by upwelling of the Cromwell current, is home to the majority of the Galápagos Penguins and the only place for Galápagos Cormorant as well as a plethora of seabirds, including Elliott's and Wedge-rumped Storm Petrel, Blue-footed Boobys and shorebirds such as Yellow-crowned Night Heron, Lava Heron and American Oystercatchers. Very few tourists have the privilege to visit this area due to the distance which precludes it from a standard itinerary but well worth it for the birders. Overnight cruise to Puerto Villamil on the south side of Isabela Island. With an abundance of lagoons, mud flats and mangroves, this is the best place in the Galápagos for shorebirds and for a chance of seeing the elusive Mangrove Finch. Greater Flamingo, Common Moorhen, White-cheeked Pintail, Black-necked Stilt, Black-bellied and Semipalmated Plover are easily seen as well as Lava Gull. A circumnavigation of Champion Island will reveal the Charles Mockingbird and later we will explore the Highlands filling out our Finch list including; Large, Medium and Small Tree Finch, Cactus Finch as well as Small and Medium Ground Finch lower down. Vegetarian Finch, Yellow Warbler, Dark-billed Cuckoo as well as Vermilion and Galápagos Flycatcher abound. This low, windswept and wave-pounded island is home to the master of flight, the Waved Albatross. Present from April to December, this magnificent flying machine can be seen gliding effortlessly past our faces on the updrafts off the sea cliff. Earlier in the season one can see courtship, then nesting and chick feeding later on. Squid oil regurgitated by the adult allows the chick to grow to an enormous size. 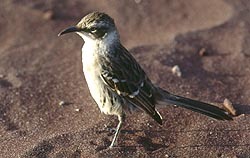 Also of interest here is the Hood Mockingbird, Galápagos Dove, the large-billed race of the Large Cactus Finch and the gray subspecies of the Warbler Finch. In addition there is an abundance of the Small Ground Finch and Galápagos Flycatcher and usually a pair of Galápagos Hawks. 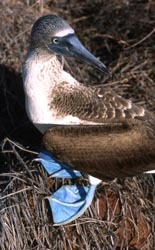 Large colonies of Blue-footed Booby and Nazca Booby allow us to study the birds and their courtship and nesting up close. Afternoon cruise towards San Cristobal looking for Dark-rumped (or Galapagos) Petrel as well as Madeiran and Wedge-rumped Storm-petrel. Overnight cruise continuing to San Cristobal. Day 7. San Cristobal and Santa Fé. San Cristobal or Chatham is home to more endemic birdtaxa than any other island in the Galapagos, having 1 endemic species, Chatham Mockingbird, and 4 endemic subspecies of Finches and Vermilion Flycatcher. We shall visit the surrounding coastline as well as the highlands were we will have our last chance for different seabirds, Galapagos Martin, Paint-billed Crake and Galapagos Rail. Midday cruise to Santa Fé. This small island together with San Cristobal have the most endemic taxa of reptiles in Galapagos and we will make a short stop to look at the Santa Fé Land Iguana. This central island has been the focal point for the evolution of Darwin's finches due to cycles of emigration, speciation and immigration. Nine Finch species are present here and only Isabela has more (10 species) but is less accessible. Along with filling out our Finch list we will search for the Galápagos Rail and observe Galápagos Martin. A visit to the Charles Darwin research center and the Highlands will complete our visit. Day 9. Baltra and flight to Quito. Early-morning visit to Turtle Cove to see the Green Sea Turtles mating and for last looks at Magnificent Frigatebirds, herons and shorebirds, then transfer to airport for flight to Quito. Included: All lodging, meals, expert bilingual birdguide, round trip air Quito-Galapagos, transportation, hotel transfer and entrance fees.